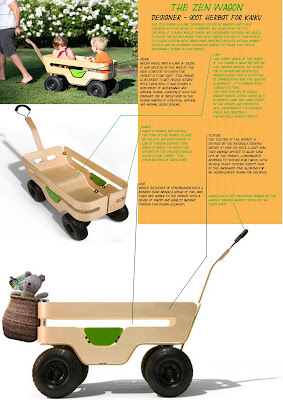 My product is Kaiku's "Zen Wagon" designed by Scot Herbst. As for a reflection on the product itself, I'll start by saying that it is an excellently designed product. The use of a number of design priniciples go together to create a beautifully organic and thoroughly thought out end product. The use of material and its processing is the highlight of the design, together with how this is utilised to create an intelligent and astute ergonomic seating arrangement for the users of the product (children). The use of the material also allows for no sharp edges on the product, again another wily aspect of the design through material choice. However, for what it does, it does extremely well and with excellent design thought going into it, it does deserve the bronze medal it was awarded at the International Design Excellence Awards. From this exercise, I appreciate the need to look closely at a design product to understand why and how it succeeds as a piece of design in terms of minute aspects of that design, and also to appreciate how the individual designer came to utilise different principles to achieve that excellence in the product. I learnt furthermore what to look out for and how it can affect a product's success or failure in terms of design principles. It was a helpful exercise in terms of stretching the mind to allow this thought process to begin to happen.